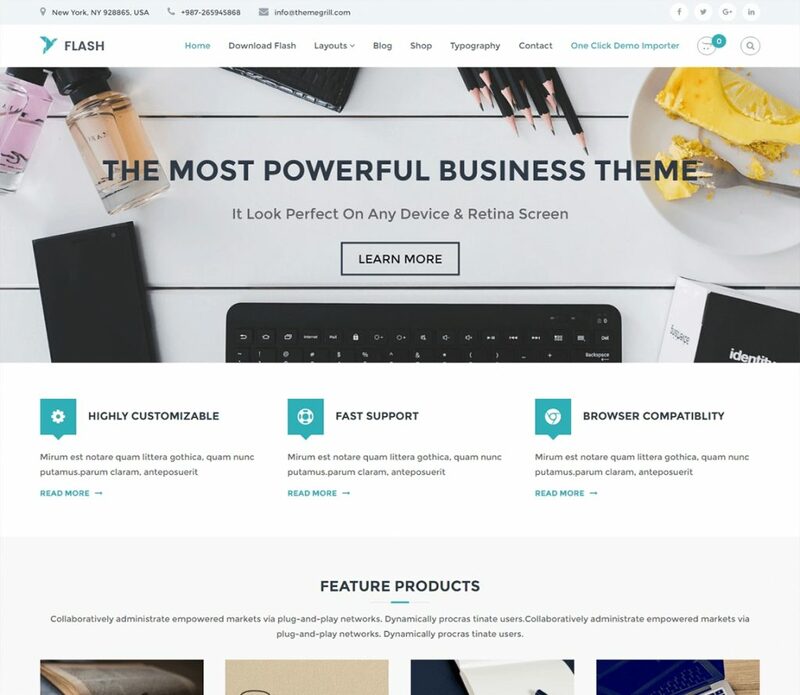 As the result of our tireless effort and hard work, we are proud to introduce Flash theme to you – our most flexible free multipurpose WordPress theme ever. Yes, Flash theme is finally here. To tell you the truth, our team has been striving relentlessly to come up with a great theme that users can truly value. Fed up with the mushrooming themes, we envisioned a feature-rich FREE theme that can empower you to create a great site. And, finally, we created a fantastic theme called ‘Flash’. Flash is aesthetically beautiful by design, simple to use, powerful by its features. 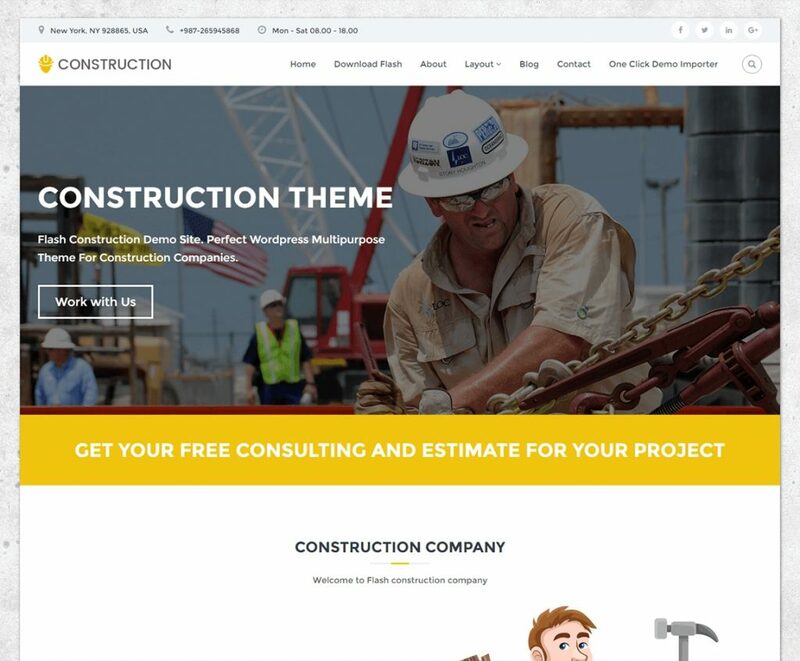 The integration with the SiteOrigin’s Page Builder and the Flash Toolkit plugin make the theme really awesome. 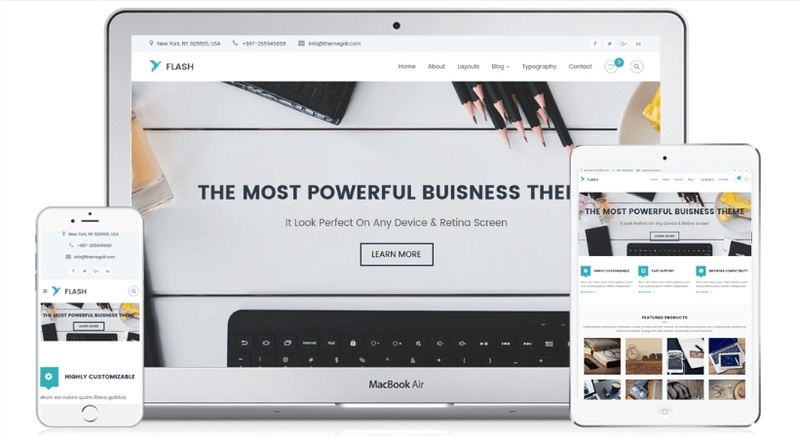 Flash is a fully responsive modern WP theme in which each element is seamlessly integrated and crafted with care. The theme adapts perfectly with any device and also your site content looks really great. The theme offers plenty of customization options so that you can completely control the design of your site and create websites for any niche. 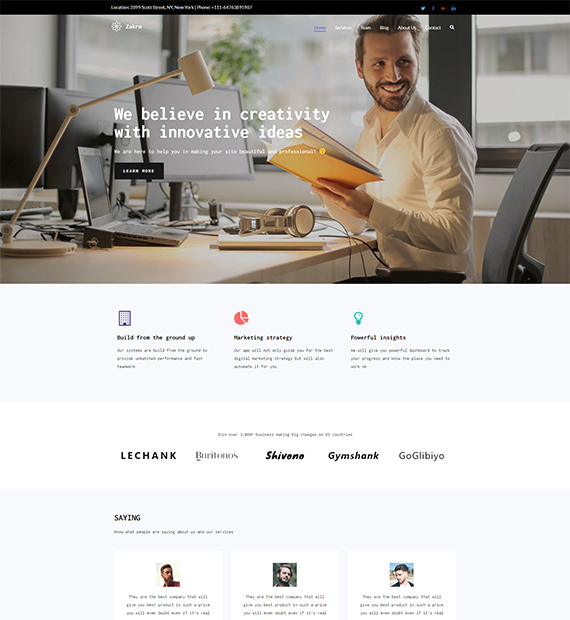 It is the best free multipurpose WordPress theme which is suitable for business, blog, portfolio, landing page, one-page style business site, creative agency, construction, food, and restaurant or any kind of site. Precisely, it is a layman theme – probably the easiest theme we have created yet. If you are just a blogger or a business owner who wants to create a blog, portfolio or a business website, this theme is a perfect pick for you. You can just follow the steps as suggested in the theme instruction doc and instantly create a complete website of your own without touching a single line of code. Besides, we promise you dedicated support – contact our support team whenever you have any query. Flash Toolkit plugin is specially developed to empower Flash theme. It contains 11+ awesome WP widgets that let you add and customize various sections in your website. Yes, you can create multiple types of web pages very easily with powerful drag and drop widgets. The widgets are not ‘just the widgets’ but powerful tools with plenty of customization options. You can find multiple layouts for each widget/ content section. Each of the widget layouts is designed by the professional designers so as to provide you the stylish and gorgeous designs. Simply drag and drop the widgets in the page builder and you create rocking pages. FT: Slider – Flash provides you slider options at your fingertips with FT slider widget. Easily add beautiful image slides and customize them. You can showcase your amazing features at sliders. FT: About – Share your story and inspire others. Add the text, image, read more button and text and save it. It is an awesome way to display feature your company/ product and build a brand. FT: Heading – You can create beautiful headings for different sections using the FT Heading widget. It allows you to add heading title and a short description that appears as the subheading. FT: Logo – The widget is useful to display the clients’/ partners’ logos. Adding logos of your partners help you to build trust among the website visitors. FT: Portfolio – Display your amazing portfolio & recent work on homepage using the FT Portfolio widget. This widget uses custom portfolio posts with the related category as the portfolio. Featured image of the post is the portfolio image. Furthermore, there are multiple layout options for FT Portfolio widget as well while it’s more interesting with the filter display option. You can display the portfolio content based on the categories. Have a look at the image below to see how portfolio filter works. FT: Service – You can show your main services right on the homepage using FT Service widget. Add title, service icon/ image, text, button text & button URL for each service easily. FT: Blog – Now you can display your latest blog posts, news, and updates in an elegant grid layout. You can keep your website visitors updated with a regular blog. FT: Team – Your customers may like to know about you and your team. The widget lets you create an alluring team section within seconds. FT: Testimonial – Testimonial is an essential part of a business website as it helps to increase trust to your product/ service among new visitors. Create wonderful testimonials using the FT Testimonial widget. FT: CTA – You can easily create appealing Call to Action buttons using the widget. Insert custom title, subtitle, button & button URL as per your need and choose a CTA style you like. FT: Animated Number Counter – Displaying the figures/ numbers is a great way to grab the users’ attention. You can display the total number of the sales, happy customers etc. so that more people join you. SiteOrigin’s Page Builder is one of the most popular WordPress plugins ever. The plugin lets you create beautiful web pages instantly using drag and drop widgets. 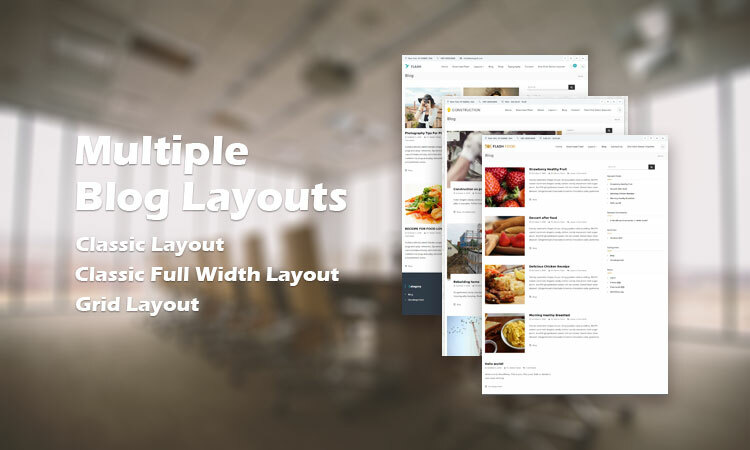 You can create fully responsive page layouts without writing a single line of code. Flash Toolkit plugin and SiteOrigin’s page builder together provide most of the customization options for Flash theme. Flash is just amazing with the full-fledged support of the handy plugins. 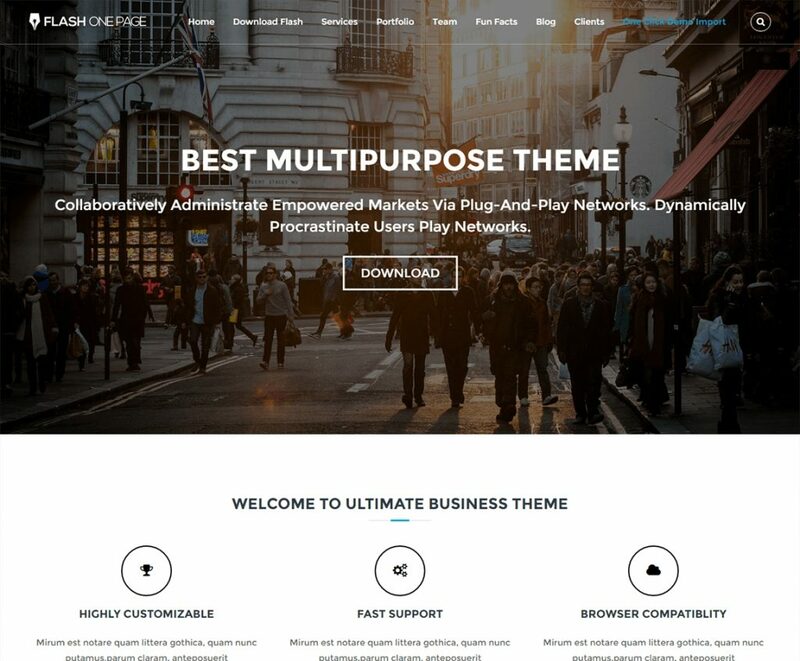 FREE theme with #4 amazing demos – Interesting! Yes, there are four marvelous demos for Flash theme. It may be the first time you saw any free theme that is offering so many demos. This is to show you how flexible and feature-rich the theme is. Flash allows you create actually any type of website – blog, business, portfolio, food restaurant, eCommerce, construction, landing page or any kind. 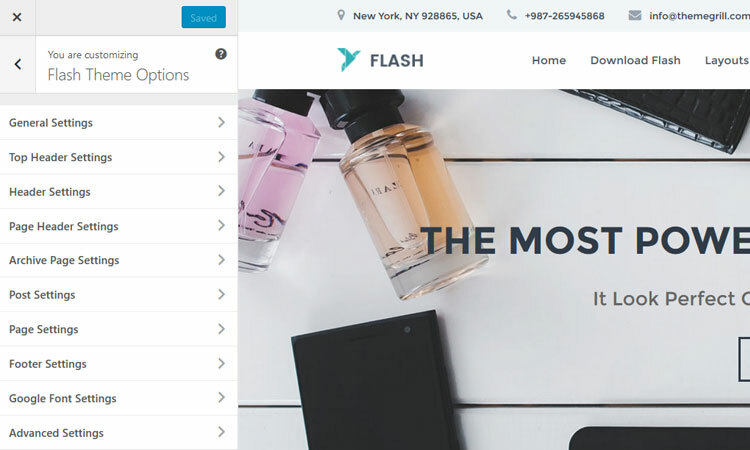 Create a demo-like website or a different one with your own design, Flash lets you do that. Below are the screenshots of the four demos. You can click on the image to view the full demo. Flash is completely based on latest WordPress technology. Built on WordPress live customizer, you can instantly customize the theme with live previews from the Customize option. Customize your site identity – site title, logo, tagline, header settings, page settings, post settings etc. from the Customizer. It’s easy, fast, and efficient working with Customizer tool. You may have lots of interesting stories, news, updates, articles and more that you want to share with your audience. That’s not a big deal but it goes a complete fuss if you don’t have an attractive blog. Having a beautiful blog page adds value to your website users as well as helps you engage users and improve your SEO rankings too. Therefore, we passionately created stunning blog layouts. 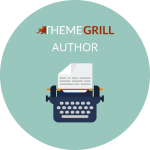 The free version of the theme offers you three different smart blog styles – Classic, Classic full-width image, and Grid layout. You can choose anyone from there and create an engaging blog page. 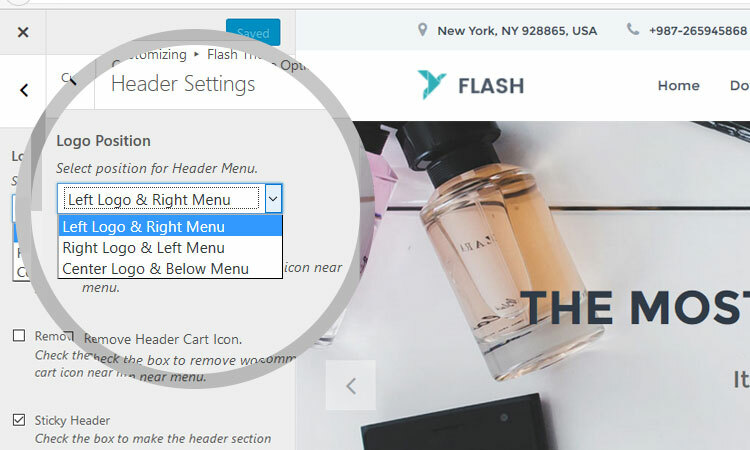 Find ‘Flash Theme Options’ in the Customizer tool, go to ‘Archive Page Settings’ from and choose the blog style you like. This is again a feature that you can find only in the premium themes. Yes, free themes usually come with limitations but not this time. 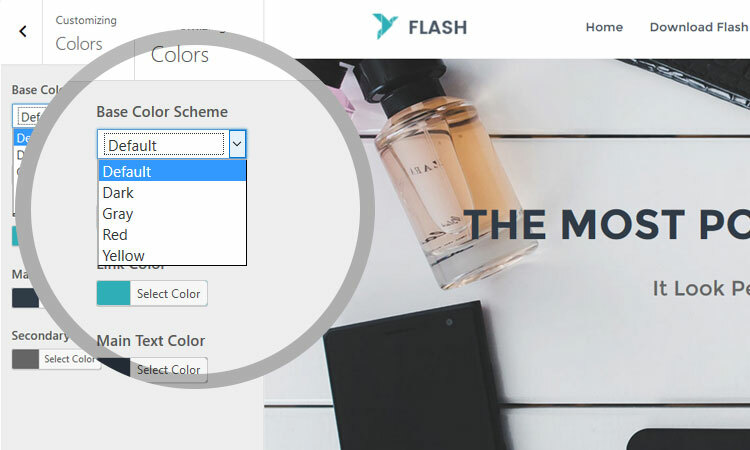 Flash theme offers you limitless color customization. The theme offers you Base Color Scheme option which changes the whole site appearance on 1 click. There are 5 logically prepared base color schemes by default: Default, Dark, Gray, Red, and Yellow. Each base color scheme includes background color, link color, main text color and secondary text color. Choose any one from the three pre-made base color schemes that yours the niche of your website. That’s not all; you can also customize it further. Change the colors as per your wish and configure unlimited. Header options and styles are actually terrific! You can fully customize: Top Header, Main Header & Page Header as per your wish. Top Header is to display social icons and contact info. You can either display both social menu & contact info or display any one of them. If you don’t want a top header, you can disable it. Main Header provides you option to choose the logo position for header menu. You can choose from the three positions available: Left Logo & Right Menu, Right Logo & Left Menu, and Center Logo & Below Menu. Furthermore, You can keep or remove the search box and sticky header. Page Header is to show title and breadcrumbs in the pages. You can enable or disable the page header and also remove the breadcrumbs if you don’t want them in the page header. And, that’s not all. There are more features which you may love. View all features by clicking here. Honestly, ‘Users and users’ are the motivations behind creating this theme. 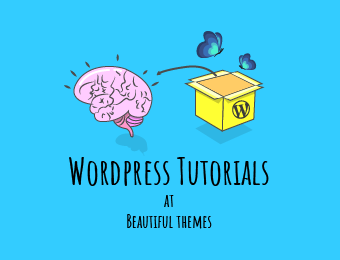 The main motto of creating this theme is to provide millions of our loyal customers as well as billions of WordPress lovers across the globe with a ‘genuinely useful theme’. You can experience both the multipurpose and minimalist web design at their best in Flash theme. 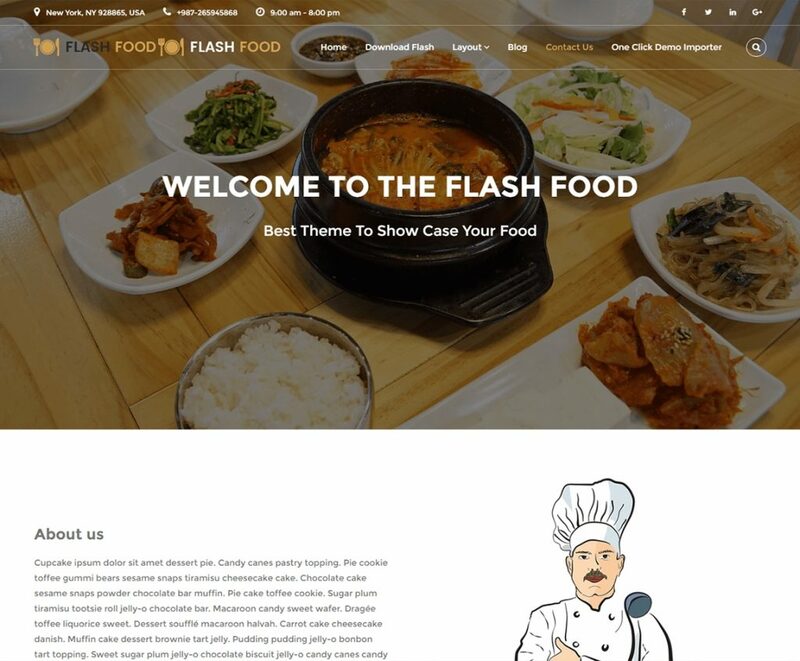 Consequently, Flash is extremely fabulous – the second generation FREE WordPress theme. Fully widgetized theme, limitless customization options, powerful features and incredible support – unbelievable for a free theme. It is for sure one of the best free multipurpose WordPress themes on the web. You may also like to view all our free WordPress themes. I need to change the copyright section to Copyright © sdp, how can i do so. Any hep would be greatly appreciated. Thanks for dropping by. In our next update, in footer link will make copyright © followed by the site name (this will link back to home page of your site). Hope this will help. Is possible to remove /portfolio/ in permalink? You cannot remove /portfolio/ in permalink but you can set a custom permalink. For that, go to Settings> Permalinks and under Portfolio Permalinks, set your Custom Base. For some reason, text wrapping isnt working. It works in the WP page editor but not on the live site after I hit update. What’s happening? Thanks for the heads up. The issue will be fixed in our next update. We will provide you a CSS solution for now, please kindly contact our support team (https://themegrill.com/support/). I just wanted to say this is honestly an impressive theme, and for free! I’m amazed at all the possibilities, it’s been very helpful to start a project. Thank you! I love this theme features, is there anyway I can change it from one page to multi page ? I assume all of the 11 free plug-ins are for the paid version? It appears to confusing, do you mean 11+ custom widgets? If you are asking about 11+ custom widgets, they are available on the Flash theme’s free version. There are more additional custom widgets (18+) in the paid version. Hi just to ask can i change the header color from white to any color? Please contact our support team via live chat, forum or support ticket (https://themegrill.com/support/). We will instantly help you with this. Hi .. do you have the child theme together? You can can download the Flash theme child theme zip file from this article.